In this post, we will be going through a subject namely arrays. Arrays, Lists, Hashmaps and similar statements are ways to store multiple values inside one variable name. Arrays basically are tables that hold values in a specific index. For example if I had a task to input 1000 names the traditional way of creating a new variable for every name is not a smart way to do it. To help us out, we create an array to hold all these names inside one array (name) that we can use to access these names and values in general. The best way for me to explain this basically is through a picture and a code copy paste like in the below. Just meditate on the code, the output and the picture. Then proceed to the theory. The arrays in the below examples are one dimensional. where the index basically means the reference number that you use to pick up the value that this particular bit of space holds in it in your computer. Do note that arrays always start from 0 where 0 is same as 1 and so on. 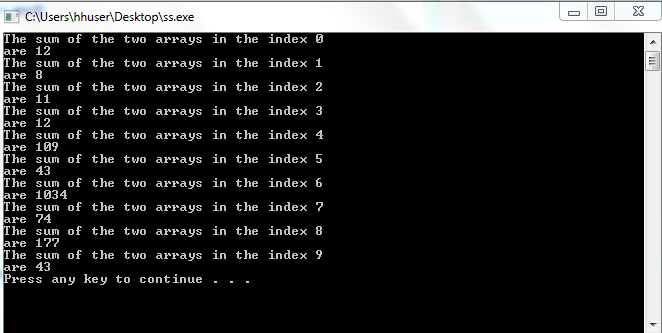 You can initialize your arrays to have a null value in the index of zero but that is another story. Below is a picture that I created with wrong amount of index’s but I thought it would be good for you to see how to create and handle arrays. 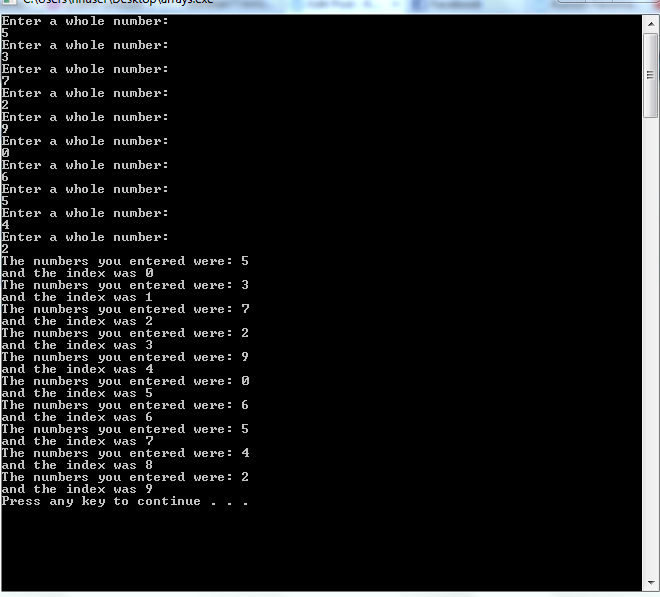 So you see that creating an array with 9 values also has 9 index numbers but the counting starts at 0. This array or table as we call it, has an index number meaning that it has a reference number that we can use to read, output, modify, input or delete the value that it is holding. This index numbering always start with zero(0). You can see in the picture that the numberTable holds the value 5 and numberTable holds the value 42 and this is why we ended the for loop before 10 or else we would have had an array out of boundary error message. Below is the for loop code. that would output the value 6. 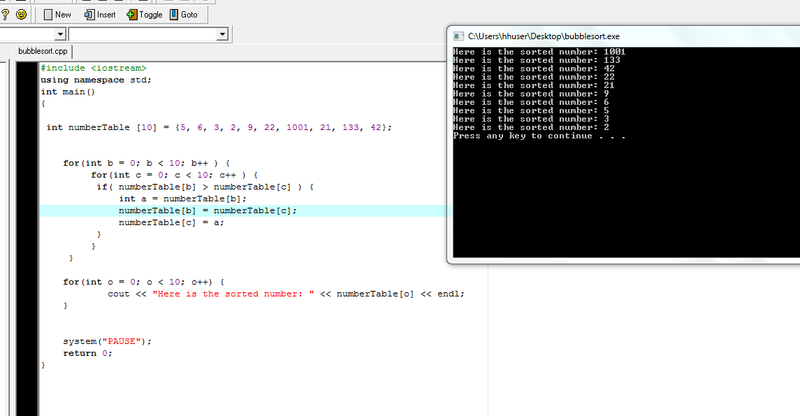 Below is another example code where we input values inside our array and we output the values we entered. below is a sum program to use two arrays and sum two values. Below is the code for my own bubble sort algorithm to sort the values from biggest to smallest that I wrote in few minutes. The algorithm is fairly simple, but my own version is not very efficient and there are probably more better built ones out there. You can just reverse some code bits to output from smallest to biggest. I will add the logic behind this probably later but the basics are that you take one value one by one and compare it with the whole pack and switch places thus having values ordered in the way you want. I will publish this now and update + add more content later. I have noticed that whether I am home, work or school the wordpress does not always work properly meaning that you have to refresh ten times the pages before you get anything on the screen if you try to access my pages the first time.